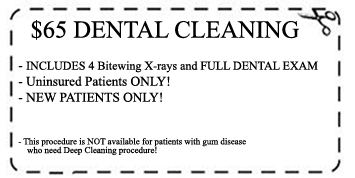 – NEW PATIENTS’ PROMOTIONS (ANY PROMOTION WITH “NEW PATIENTS ONLY” PHRASE IN THE COUPON) ARE VALID FOR NEW PATIENTS (PATIENT WHO VISITS OUR OFFICE FOR THE FIRST TIME TO CONSULT FOR “THE” PROMOTED PROCEDURE / PROCEDURES) ONLY! NEW PATIENTS’ PROMOTIONS WILL NOT BE HONORED FOR PATIENTS WHO VISIT OUR OFFICE BEFORE, DURING OR AFTER ANY PROMOTIONAL DATE TO CONSULT FOR A DIFFERENT PROCEDURE ,OR THE SAME PROCEDURE WITHOUT MENTIONING AN ADVERTISED OFFER. 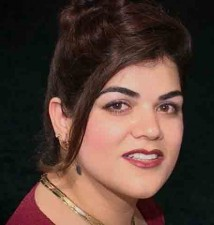 – American Dental Center Will match Prices listed by any Dental Office within the state of Texas. anytime during the promotion period. 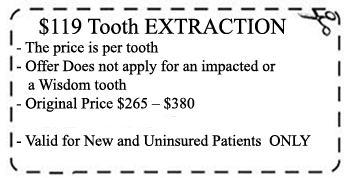 – Promotions which are designed for New Patients ONLY, do not apply to new patients covered by a dental insurance acceptable by our office, unless the coupon states otherwise, or the promoted procedure is not covered by the patient’s Dental Insurance Plan! – All our promotional Prices are for the specific procedure mentioned on the ticket. Extra charges may increase depending on the treatment requirements. are not limited, and apply to all patients! 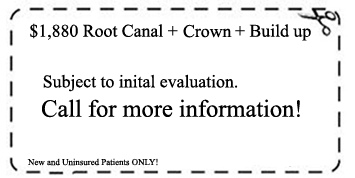 – Promotional offers for porcelain crowns DO NOT include temporary crowns! 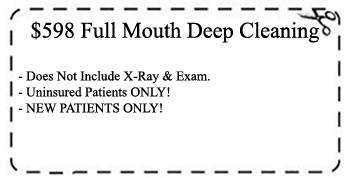 used based on patient’s request, and Doctor’s approval for an extra charge! – promotional prices are valid only for time periods listed on each coupon.